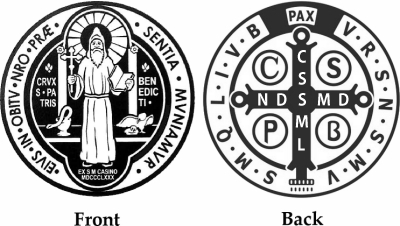 Catholic News World : What is the St. Benedict Medal? 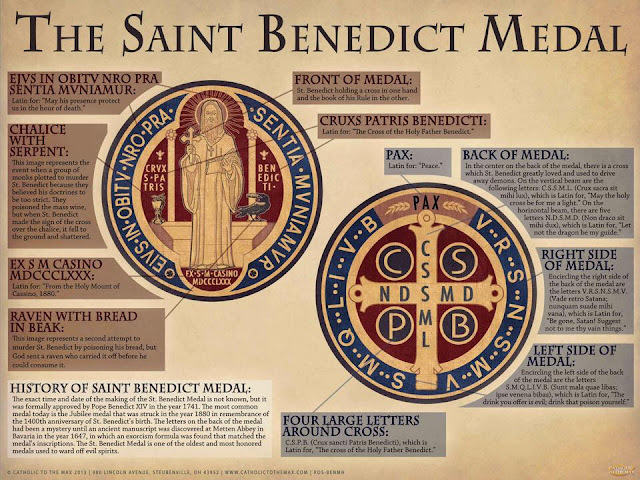 FAQ - SHARE #StBenedict's Medal of Powerful Protection! What is the St. Benedict Medal? FAQ - SHARE #StBenedict's Medal of Powerful Protection! St. Benedict of Nursia, Italy (A.D. 480-543), the twin brother of St. Scholastica, is Father of Western monasticism. His “Rule of St. Benedict” is the rule for many religious orders. The Benedictine Order is located at Monte Cassino, Italy, about 80 miles South of Rome). He had been living as a hermit in a cave for three years, when a religious community came to him after the death of their abbot and asked Benedict to become their leader. Some of the “monks” didn’t like this and tried to kill him with poisoned food. St. Benedict made the sign of the Cross over the food, and became aware they were poisoned, then toppled the cup and told a raven to carry off the bread. About the Medal The Jubilee Medal of St. Benedict according to the Catholic Encyclopedia : FRONT One side of the medal bears an image of St. Benedict, holding a cross in the right hand and the Holy Rule in the left. On the one side of the image is a cup, on the other a raven, and above the cup and the raven are inscribed the words: “Crux Sancti Patris Benedicti” (Cross of the Holy Father Benedict). Round the margin of the medal stands the legend “Ejus in obitu nostro praesentia muniamus” (May we at our death be fortified by his presence). BACK The reverse of the medal bears a cross with the initial letters of the words: “Crux Sacra Sit Mihi Lux” (The Holy Cross be my light), written downward on the perpendicular bar; the initial letters of the words, “Non Draco Sit Mihi Dux” (Let not the dragon be my guide), on the horizontal bar; and the initial letters of “Crux Sancti Patris Benedicti” in the angles of the cross. Round the margin stand the initial letters of the distich: “Vade Retro Satana, Nunquam Suade Mihi Vana — Sunt Mala Quae Libas, Ipse Venena Bibas” (Begone, Satan, do not suggest to me thy vanities — evil are the things thou profferest, drink thou thy own poison). At the top of the cross usually stands the word Pax (peace) or the monogram I H S (Jesus). The History of the Jubilee Medal The medal was made in 1880, to commemorate the fourteenth centenary of St. Benedict’s birth. The Archabbey of Monte Cassino has the exclusive right to strike this medal. The ordinary medal of St. Benedict usually differs from the preceding in the omission of the words “Ejus in obitu etc.”, and in a few minor details. (For the indulgences connected with it see Beringer, “Die Ablässe”, Paderborn, 1906, p. 404-6.) The habitual wearer of the jubilee medal can gain all the indulgences connected with the ordinary medal and, in addition: (1) All the indulgences that could be gained by visiting the basilica, crypt, and tower of St. Benedict at Monte Cassino (Pius IX, 31 December, 1877) (2) A plenary indulgence on the feast of All Souls (from about two o’clock in the afternoon of 1 November to sunset of 2 November), as often as (toties quoties), after confession and Holy Communion, he visits any church or public oratory, praying there according to the intention of the pope, provided that he is hindered from visiting a church or public oratory of the Benedictines by sickness, monastic enclosure or a distance of at least 1000 steps. (Decr. 27 February, 1907, in Acta S. Sedis, LX, 246.) Any priest may receive the faculties to bless these medals. Origins It is doubtful when the Medal of St. Benedict originated. During a trial for witchcraft at Natternberg near the Abbey of Metten in Bavaria in the year 1647, the accused women testified that they had no power over Metten, which was under the protection of the cross. Upon investigation, a number of painted crosses, surrounded by the letters which are now found on Benedictine medals, were found on the walls of the abbey, but their meaning had been forgotten. Finally, in an old manuscript, written in 1415, was found a picture representing St. Benedict holding in one hand a staff which ends in a cross, and a scroll in the other. On the staff and scroll were written in full the words of which the mysterious letters were the initials. Medals bearing the image of St. Benedict, a cross, and these letters began now to be struck in Germany, and soon spread over Europe. They were first approved by Benedict XIV in his briefs of 23 December, 1741, and 12 March, 1742. How to wear the medal 1. On a chain around the neck; 2. Attached to one’s rosary; 3. Kept in one’s pocket or purse; 4. Placed in one’s car or home; 5. Placed in the foundation of a building; 6. Placed in the center of a cross. In the name of God the Father + almighty, who made heaven and earth, the seas and all that is in them, I exorcise these medals against the power and attacks of the evil one. May all who use these medals devoutly be blessed with health of soul and body. In the name of the Father +almighty, of the Son + Jesus Christ our Lord, and of the Holy + Spirit the Paraclete, and in the love of the same Lord Jesus Christ who will come on the last day to judge the living and the dead, and the world by fire. Let us pray. Almighty God, the boundless source of all good things, we humbly ask that, through the intercession of Saint Benedict, you pour out your blessings + upon these medals. May those who use them devoutly and earnestly strive to perform good works be blessed by you with health of soul and body, the grace of a holy life, and remission of the temporal punishment due to sin. The medals are then sprinkled with holy water. Permissu superiorum -Nihil obstat and Imprimatur, Saint Cloud, 24 April 1980.